A better way to help your clients begins here. A step-by-step Roadmap to Development for sustainable behavior change. Watch our free introduction to get an overview of all the benefits of the SSPS that you and your clients can quickly achieve. A developmental framework based on a seamless integration of neuroscientific theories. Understanding of the true drivers of behavior. And the concrete results your clients expect and deserve. 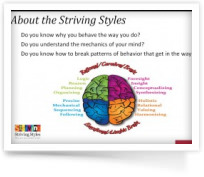 It's all here in the Striving Styles Personality System. Learn how this powerful framework can be specifically applied to your business or practice and help clients, as well as with clients and in organizations.